In The Day the Universe Changed, Burke explored the sequential impact of discovery, innovation, and invention on how people defined reality itself. “You are what we know,” he wrote “and when the body of knowledge changes, so do we." In this view of change, knowledge is invented as much as it is discovered, and new ideas “nibble at the edges” of common knowledge until values considered permanent and fixed fade into antiquity just like any other obsolete tool. Burke said that our system of knowledge and discovery has never been able, until recently, to handle more than one or two ways of seeing things at a time. In response we have long demanded conformity with the dominant worldview or with similarly homogenous ideological binaries. You may have noticed that when we browse the news or type into Google we tend to seek confirmation more than we do information. We predict our current model will remain untarnished. When we want to make sense of something, we tend to develop a hypothesis just like any scientist would, but when we check to see if we are correct, we often stop once we find confirmation of our hunches or feel as though we understand. Without training, we avoid epiphany by avoiding the null hypothesis and the disconfirmation it threatens should it turn out to be valid. Since the 1970s, Burke has predicted we would need better tools than just search alone if we were to break out of this way of thinking. His new app aims to do that by searching Wikipedia “connectively” and producing something the normal internet searches often do not – surprises, anomalies, and unexpected results. With the app, one would be able to pick two seemingly unrelated ideas, people, objects, events, inventions, works of art, or whatever, and then watch as the artificial intelligence carves a visual path through the articles on Wikipedia and forms a series of interactive nodes linking them. 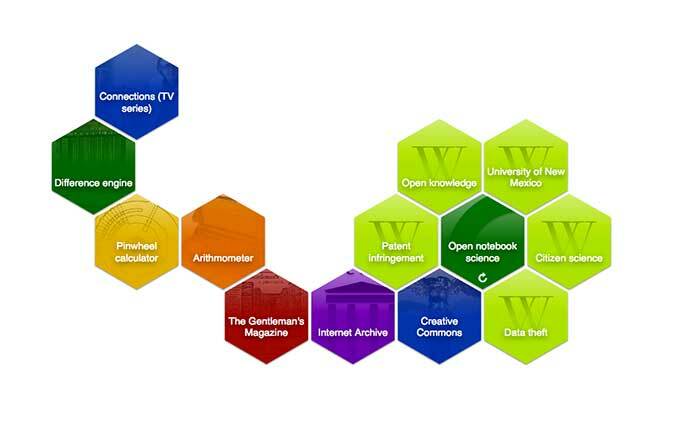 Each node can then be explored or summarized, and the whole chain can be saved or shared. Users would also be able to carve their own paths, visualizing the possible links at each stage, or choose a single topic and watch as the app delivers a selection of possible endpoints, some expected, and some bizarre. When I got a chance to play with the preliminary version of the app, I started with Charles Darwin. After typing in his name, a hexagon appeared with six possible paths I could take. Those paths could be reset as many times as I wanted, but I chose to go off in the direction of natural selection which collapsed the other branches and created a new hexagon with the Charles Darwin node still attached. The new hexagon offered six new paths, and on I went down a chain of connections until I arrived at Frankenberry Cereal. That might seem like just a bit of fun trivia, that Darwin and Frankenberry are linked together in an academic six-degrees-of-separation sort of way, but along that path I learned how advances in biology led to the mass production of gelatin. That took me to the history of pectin, fruit roll-ups, and something I had never heard of before called “Frankenberry Stool,” the pink poop that comes from eating too much monster-based manufactured breakfast which caused a short-lived health scare in the early days of artificially dyed food. In the 1990s, Burke began working on a Knowledge Web, a mostly invite-only, experimental interactive media project built on the same principles as his approach to the history of science, innovation, and change. The K-Web allows users to visualize and navigate information outside of the way it is presented in books or libraries, and to move between nodes connection in a dense, interconnected sprawl, like neurons wired together into tethered constellations of association and influence. Today it features 2,800 people linked 30,000 ways, but the Connections app would apply the tools developed in that project to the megastructure of Wikipedia, adding five million new nodes with a yet-to-be-estimated number of new links between them. Richard Ingram, a professor of Educational Technology at James Madison University is heading up the dev team working on the project. Ingram said that should the Kickstarter be successful, a portion of the revenue from app sales will be donated annually to Wikipedia itself and “James himself asks that he receive no compensation.” Instead , he wishes for sales to go to his non-profit to help distribute the app so that it can be used in education.